Henk van Spanje - Kobelco Construction Machinery Europe B.V. Automotive recycling is big business. Around six million vehicles reach the end of their useful lives in Europe every year, but they still have a significant value as a source of spare parts. A typical passenger car is made up of around 65% steel and iron as well as copper fibres, glass and plastics, and at least 95% of the car’s total weight can be recycled or reused. 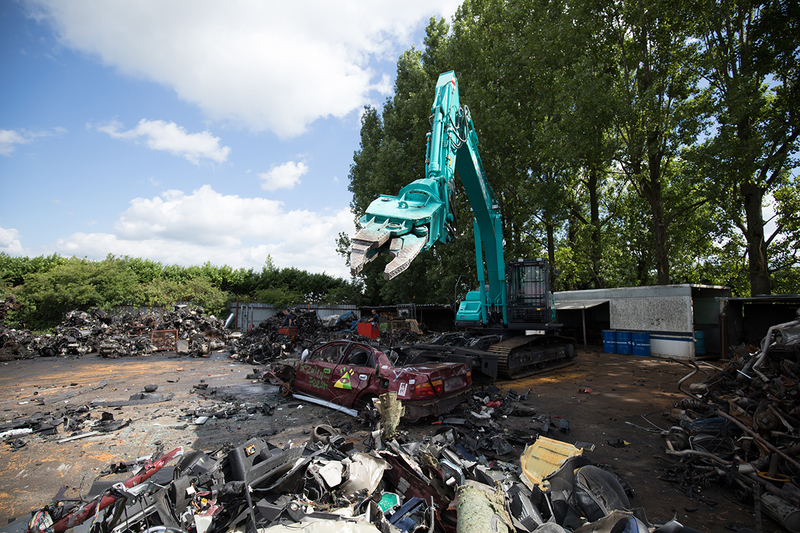 Of course, automotive recycling is a specialist industry and the process is extremely complicated. Modern vehicle recycling attempts to be as cost-effective as possible, but with strict EU directives that lay down rules on the monitoring of the reuse/recovery and reuse/recycling targets for such vehicles, auto dismantling yards also need to seriously consider the environmental impact of their recycling processes. Driving though the countryside on the outskirts of Ingen in the Netherlands, you’d be forgiven for missing Autodemontage Spanje & Zn, which is located behind a line of mature Poplar trees, just off the roadside. The company, which was established in 1964 by Henk van Spanje, specialises in automobile reclamation and is now one of the top five car dismantling companies in the Netherlands. 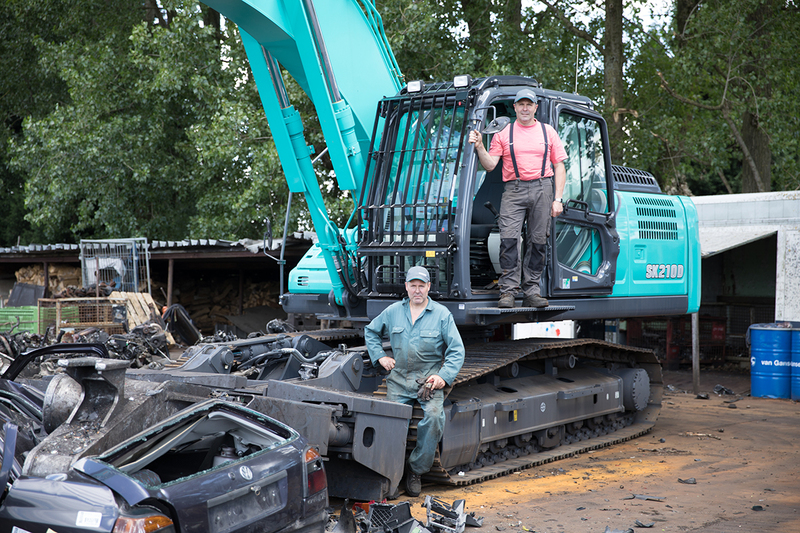 Now run by Henk’s three sons, the company was recently the first in Europe to take delivery of a Kobelco SK210D Car Dismantling machine. Henk van Spanje is originally from a farming background, but decided to go into auto reclamation when the industry started to pick up in the early Sixties. Henk Jr has been involved in the family business for as long as he can remember – as a child, he regularly helped his father in the yard, and when he was old enough to drive, he learnt to operate a mini excavator on the site. The forty-seven-year-old and his two brothers, Ries and Jan Willem, are now at the helm, but even at 88 years old, Henk Sr is still a regular face at the yard and can often be seen driving one of the forklift trucks, although he is understandably less involved in running the business. Autodemontage Spanje & Zn’s yard is a labyrinth of rusty old vehicles – a graveyard for cars and trucks that no longer have a place on the road. Most of the cars come from other companies and have either been in accidents or have reached the end of their life. When such a vehicle arrives on site, there is some manual disassembling to do in the workshop before the SK210D can get to work. First the wheels, tyres and the battery are removed before the vehicle is drained of its fluids and other hazardous substances including engine coolant, oil, transmission fluid and fuel. Other valuable parts, such as the audio system, may also be removed for resale or restoration. Fifty years ago, Henk Sr. would have done a lot of this manual work himself, fairly ungracefully with an axe! 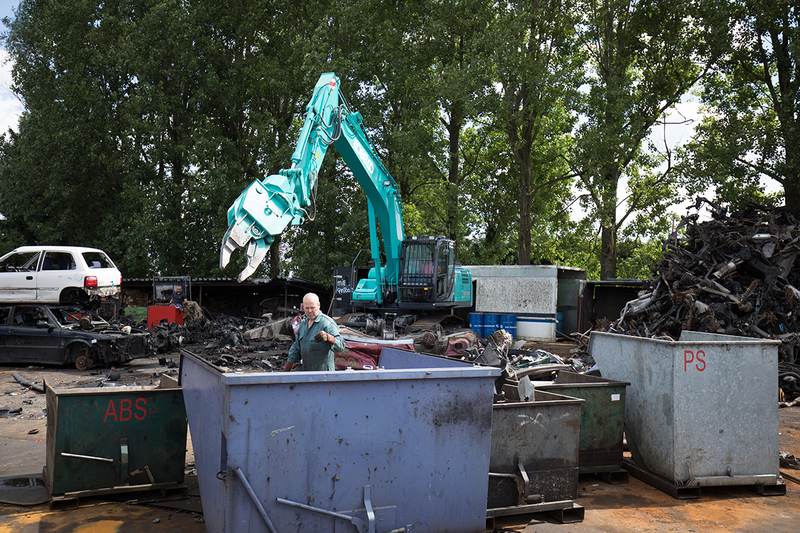 “We recycle around 4,000 cars a year and anything we don’t recycle has to go to landfill, which we have to pay for,” explains Henk Jr.
“Therefore, we try to recycle everything we can and all scrap metal goes to shredding companies. 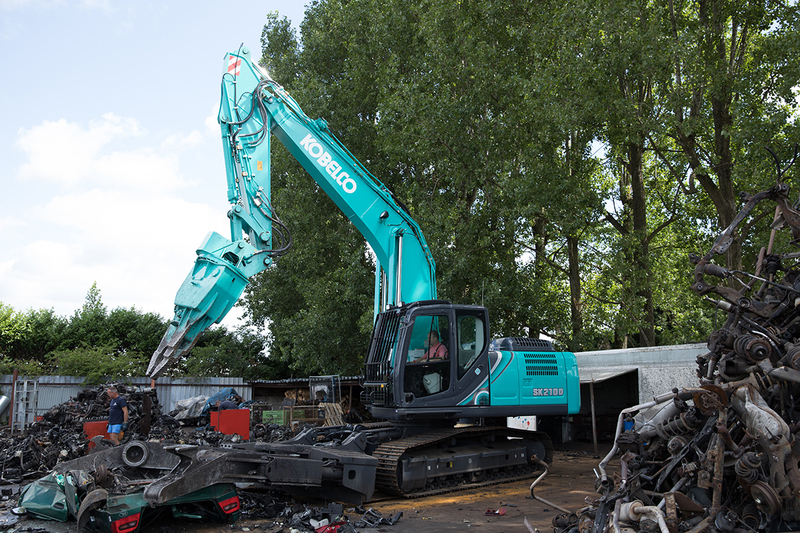 In 1979, Kobelco designed the first excavator-derived machine specifically for use in automotive reclamation within Japan, and its impact in the industry led to further investment in car dismantling technology. 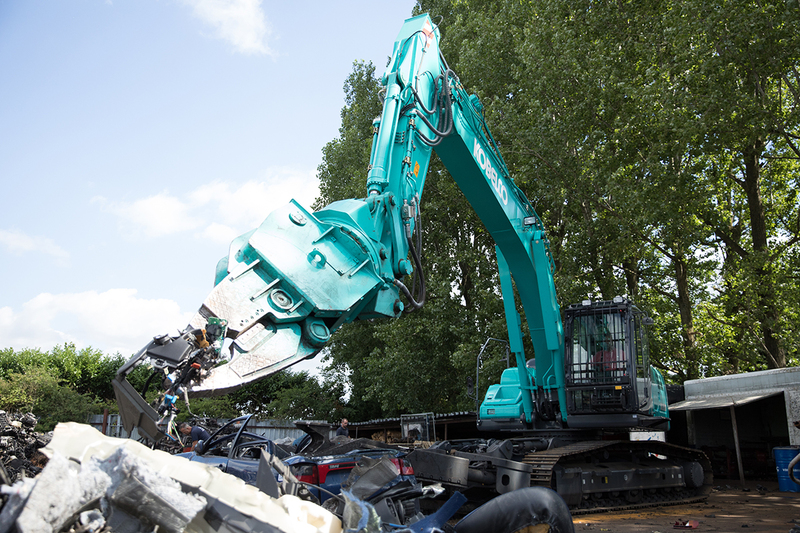 Thirty eight years later, Kobelco still leads the way in automotive reclamation with the efficient and technically advanced SK210D, which has approximately four times the vehicle dismantling capability compared with hand dismantling. At the back of the yard, Autodemontage Spanje & Zn’s SK210D stands on a thick metal plate as the concrete of the yard is very porous and will soak up the fluids dripping from the vehicles, making the ground particularly slippery in winter. Henk Jr climbs into the machine’s cabin, which is covered by a vertical grid front guard for increased safety, and fires it up. For a large and menacing-looking machine, it is actually a lot quieter than you’d expect it to be. Henk Jr wastes no time getting to work on the first vehicle – a rusty old burgundy-coloured car that has the word ‘vrijgezellenparty’ sprayed onto the side in green paint. It had obviously been used for a bachelor party but it was the end of the road for it now. Henk Jr uses the hydraulic clamp arms to securely hold the vehicle’s body, before the machine’s jaw-like pincers (nibbler), which are attached to the main operational arm, strip the vehicle of its valuable materials. Despite the size and scale of the attachment, he removes intricate strands of wiring harness from the car with relative ease and similar precision to a pair of tweezers. It takes Henk Jr just over seven minutes to disassemble this car, although he does claim that five minutes is the norm for a vehicle of this size. 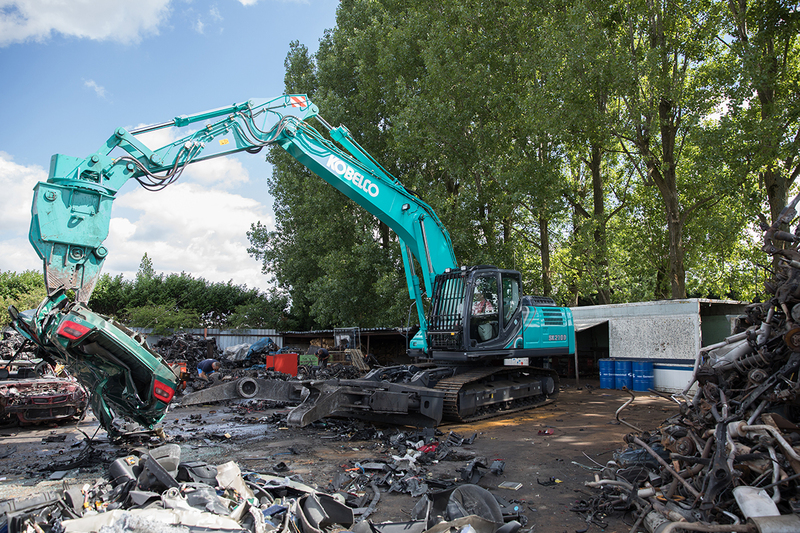 Once the valuable parts have been removed, he stacks the car’s metal shell alongside a hundred others by the shredder – when there are around 170 in the pile, he’ll put them through the machine.